In what sort of environments will you be recording? If you’re new at creating digital stories, you might not know precisely what kinds of situations you’ll want to record. You might only be interested in recording your scripts. Or maybe you want to be able to use your microphones to conduct interviews. You might even want to capture ambient environmental sounds to supplement your story’s narration. Prioritize which recording practices will be most common and most important to you. Don’t be tempted to snag a mic that can do everything. Instead, find one that does one or two things well, and add another mic later. How portable do you want to be? If you need to be extremely portable or you want to have your mic ready for any situation, you might consider something that works with your phone or tablet. Or maybe you’re okay recording into your laptop wherever you happen to be able to set up your mic. A USB microphone might work best for you. Or maybe you want to be able to have something portable, but also have the option to record on your feet. Or perhaps you’re going to park that microphone on your desktop and rarely take it anywhere else. Again, the better idea you have about how you will be using your microphone, the better the odds that you’ll land on your best microphone. How many people do you want to be able to record? If you only plan to record one person, you have a lot of options. 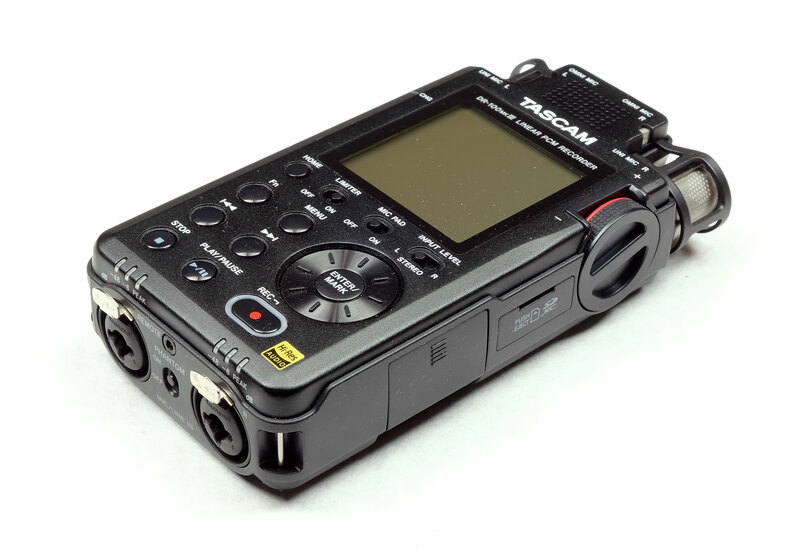 But if you want to be able to capture interviews or panels, you’ll need a recorder or audio interface that can accommodate more than one microphone. In that case, you’re going to want to skip the USB and iOS compatible mics because they’re not designed for multiple mic setups. 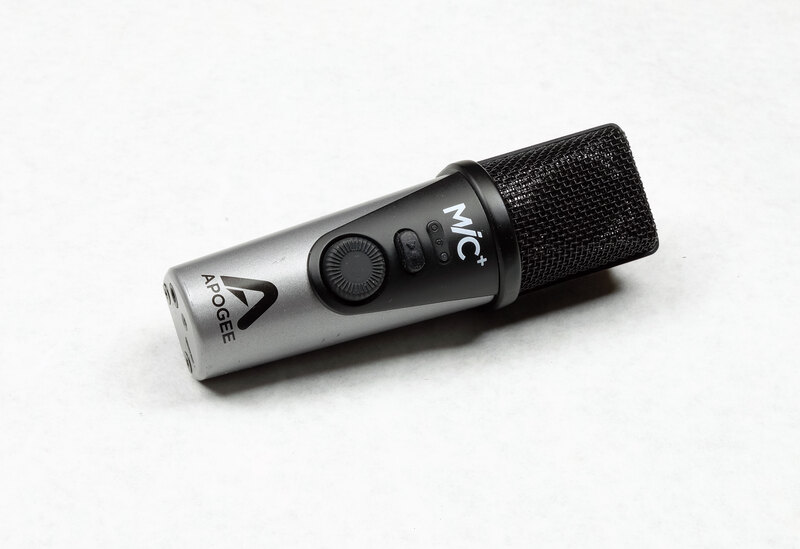 Instead, you should be considering a mic you can use with a portable recorder or an audio interface for your computer. 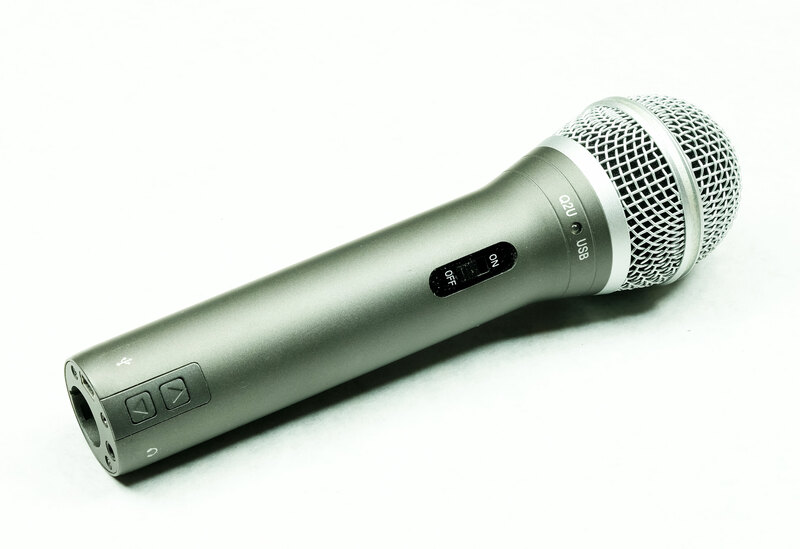 It will also be helpful to have a working knowledge of a few technical terms to help you understand the differences between certain types of mics. This one is pretty self-explanatory. Apple and Windows computers both do a pretty good job of automatically recognizing your USB microphone when you plug it into your computer. This feature is useful for people who want to keep their recording setups as simple as possible. There are a couple of potential drawbacks to USB mics though. For instance, some USB mics send a very low signal to the computer. These low levels can be a real problem for speakers with a soft voice or if you’re going to have trouble getting the mic very close to the speaker. Also, you will need to raise the volume of a low-output signal in your editing software. That can introduce some unwanted hum into your recording. You can generally address these challenges with more polished microphone technique or by purchasing a higher quality USB mic. Your other option is to choose a mic with an XLR connection. Most non-USB mics will have a 3-pin XLR connection. There are thousands of microphones with this type of connector, so you’re options are virtually limitless. The primary drawback to this type of connector is that you will need to record into a portable recorder or you will need an audio interface for your computer or mobile device. But that doesn’t necessarily mean you’re going to be paying a lot more for this setup or that it will be a lot more complicated. There are plenty of simple and inexpensive options if you’re trying to keep your budget reasonable. An oversimplified technical note here. Inside every microphone lives a metal coil with a magnet suspended inside it. When soundwaves hit the magnet, they move it back and forth inside the coil. This design creates a patterned electric current. The current is sent down the microphone cable, electronically amplified, and converted to a digital signal. Your recorded audio file is essentially a record of that digital signal. Some microphones use what’s called phantom power to assist the movement of the magnet within the coil, resulting in a stronger output signal. You don’t need to remember most of this process, but I think it might help to understand some of the options you have when choosing a microphone. 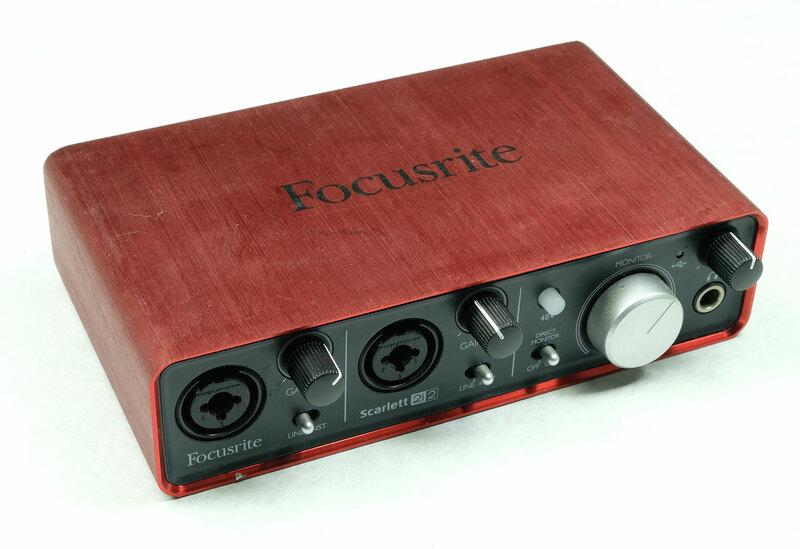 The Focusrite 2i2 audio interface. An audio interface is a piece of hardware which allows you to connect XLR microphones to your computer or mobile device. The interface takes the analog signal from your microphone, amplifies it, converts it to a digital signal, and sends it to your computer’s editing software. You only need an audio interface if you’re using one or more XLR microphones. You have a ton of choices when it comes to an audio interface, too. You can get small, highly portable models with a single mic input, or you can get something quite complicated and permanently install in your home studio (if that’s you’re jam). And there are a lot of choices in between. Eventually, I hope to offer another post covering this aspect of the recording process. Feel free to search the site to see if I’ve managed to write and post it yet. Portable recorders allow you to record audio almost anywhere you’d like. Some are small. Some are big enough to require a shoulder strap and audio bag. Some are cheap. Some cost more than my old Ford Ranger is worth. If you’re thinking about going the portable recorder route, the one thing you want to make sure is that it has XLR inputs. Some recorders, even some of the most expensive models, only have 3.5mm inputs. Those won’t work with XLR mics without an adapter cable. A recorder with two inputs should be meet most storytellers’ needs. (I am rocking a Tascam DR-100 mkIII with two XLR inputs.) But if you know you’re going to be recording a panel discussion or interviewing multiple people for a story, choose a model with enough XLR inputs. Dynamic mics are generally most useful when you want to isolate the sound of your voice from any other noise in the environment. You will often see singers on stage using a dynamic microphone because they are good at picking up the voice while rejecting most of the sounds from the rest of the performance. If you’ve ever seen a radio host talking into one of those big microphones suspended on a boom arm, they were likely talking into a dynamic mic. These mics are also really popular with podcasters for many of the same reasons radio hosts like them. The recording environments aren’t perfect, and often there are other activities taking place in nearby rooms and hallways. And finally, most news reporters you see on location also use dynamic mics for some of the same reasons. The biggest drawback of dynamic microphones is that they don’t use phantom power, which often results in a much lower-output signal than other mics. But that sort of makes sense. The lack of phantom power makes for a much less sensitive microphone. It only picks up the most prominent noises, like your voice, while rejecting surrounding sounds. Alas, your recorder, audio interface, or computer must use a “preamp” to amplify that weak signal to make it usable for recording. This point is worth remembering. If you’re shopping for an audio interface for your computer or a portable recorder, you’re going to want to pay attention to the quality of the preamps. Good preamps amplify a clean signal without introducing additional electronic noise. However, lower-quality preamps can end up adding a lot of extra noise to your narration. This noise can sometimes make editing a little tricky. It can also result in some pretty unpleasant narration. Omnidirectional microphones pick up sound equally in all directions, regardless of the position of the microphone. Most of the lavalier microphones you see on television are omnidirectional so that there’s no change in volume when someone turns their head while speaking. Omni mics, especially with a long handle, are also preferred for in-the-field interviews between a newsperson and an interview subject. However, unless you’re out in the world capturing interview subjects on the go, or wearing a lavalier for a video project, you’ll probably find other options more useful for your recording. Cardioid microphones are more directional than the omnidirectional type I just mentioned. They are more sensitive to sounds in a particular direction while tending to reject sounds from the sides and the rear. This pickup pattern is yet another strategy to isolate your voice from the ambient sounds in your environment. Instead of relying on a dynamic microphone’s lack of sensitivity, this pickup pattern relies on a more focused angle of sensitivity. As you might guess, this pattern is a more extreme version of the cardioid pattern. Shotgun microphones are a typical example of this sort of microphone, but other microphone types also incorporate this pattern. Again, it might seem most useful to isolate the speaker’s voice as much as possible, as this pickup pattern does. However, less disciplined narrators risk wandering out of the more focused area of sensitivity. This mistake can result in uneven recording levels which you will then have to fix during the editing process. The other drawback of the super/hyper cardioid patterns is that they also tend to pick up a bit more noise from the rear of the microphone than a cardioid pattern might. If you know something about audio, and you see something that I left out or just simply got wrong, please feel free to mention it in the comments below. I’ll do my best to respond as quickly as I can.